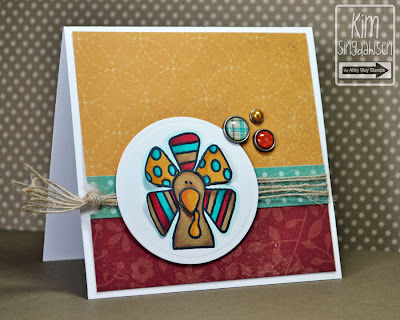 The Alley Way Stamps: TAWS October Sneak Peeks ~ Day 1 & Giveaway! Good morning! It's that time again - SNEAK PEEK TIME!!! And with sneak peeks come giveaways!!! So remember to come back EACH DAY for the NEXT 3 DAYS, cause we'll be giving one set away each day of Sneak Peeks! And on Thursday, we'll have our hop & give away ALL THREE! 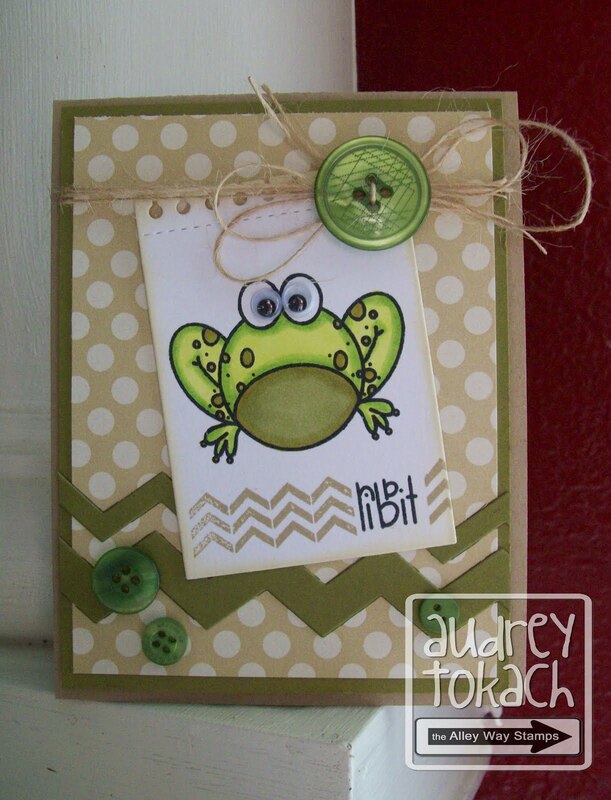 Audrey here with a fun card using an ADORABLE new set perfect for boys and girls alike! I used the little frog image from the upcoming Kid 'n Caboodle set along with the chevrons from Cover Ups. It's me, Kim... I get to show you that one of my favorites from a prior set (Cover-Ups) has been "bigged" for even more fun!! You will love all of the other stamps that go with this big turkey in the new set It's Fall About You. Lyndal here... I couldn't wait to showcase this "pairfect" new pear stamp from It's Fall About You set. Hello, Arielle here with a peek at the new set, Trees Company! How adorable are these little birdies?!? The sentiment is from Chatterbox. (I used the colors from this week's Play Date Cafe, which TAWS is sponsoring, so don't forget to go play along for a chance to win a TAWS gift certificate!) I am also giving away a free set. After the hop on Thursday, I will draw a name from everyone who left a comment on any of my 3 sneak peek posts and blog hop post, so be sure to come back each day! Thanks so much for stopping by & good luck! This set is a definite for me, as the turkey is still on of my favorite from your digi days!! these are fantastic! I LOVE the turkey!! Way cute.. awesome cards! All very cute!! Love the froggie!! Cute cards, I can't wait to see more ! Super cute cards! Love the Turkey, thanks for sharing! These are all so adorable love the stamps!!! Ohhhh...a big turkey? GREAT!!! And love these 'lil birds! :) Thanks for the chance. Lovely cards from the design team!!! SOOOO EXCITED!! the frog!!!!! and the trees and birds are ADORABLE!!!!! i am truly super excited! OMG! I'm loving these images and cards! They are all fantastic!!!! Beautiful and fun new images!!!!!! Fabulous cards! These are such fun images. Thanks for the chance to win! Just shared this post on my FB page! Thanks for another chance to win! Too cute! Love your stamps! I cannot look at that frog without thinking about it turning into a PRINCE! SO CUTE!! 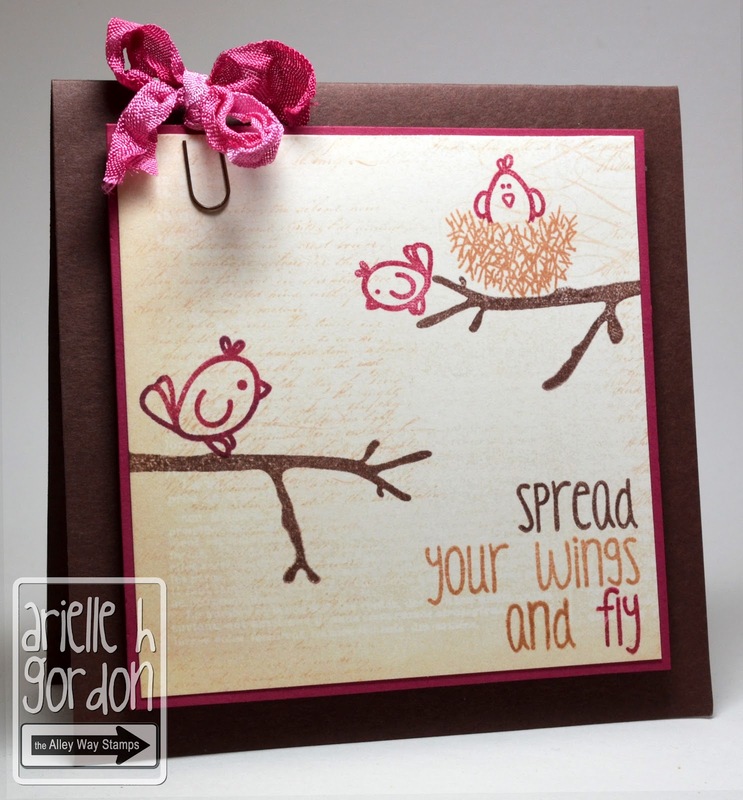 Sweet new images and what delightful card creations! So cute! So glad that you are releasing some more critters/birds. Can't wait to see the full sets! Cute stuff! LOVE the turkey's coloring! Looking forward to seeing everything! i love these!!! those birds and turkey too cute! Super cute cards! Love the little animals! Eeeeee! I love these! Everything TAWS is always so super cute! I also shared this on facebook! Awesome cards and cool sets being released!!! I love that little turkey. Can't wait to see the It's Fall About You set. Oh my goodness! These sets look adorable! Fabulous new stamps! Soooo fun to create with! LOVE these! The Turkey is my fav....so stinkin cute! I am in love with that adorable Turkey! When is the set due out??? Adorable new stamps and as always thanks for all the inspirations! What fun and cute peeks!! Love all the cards! I love all the cuteness there is!!!! Love those cards! I am torn between the frog and the turkey- both super cute!! Sweet cards DT! You have done a marvelous job showcasing these new stamps. I'm so GLAD I found this blog!!! I can't wait to see more of the Kid n' Caboodle set! Love that sweet frog! It's already sneak peek time again? Wow, the month has passed fast. Yay for new stamps to see. Love that lil froggy. The frog Kid n' Caboodle is so cute! I love his big round eyes. Such sweet cards...love the little birds in different settings. Absolutely adorable! Can't wait to see all of the new things! I love all the cuteness going on!!! Oh, just too much cuteness going around!! Thanks for a chance to win too. These are really fun! I love all the cute characters but especially the birdies! Oh how that turkey is adorable!!! Sweet inspiration today ladies! AWK!! What cute sets and adorable cards!! Love them all!